Berthoud and Elderkin have compiled a delightful reference for those in need of greater direction in their reading. Or those who may be in a reading rut and want some new ideas. Or those who don't know where to start reading. Or those who have any of the hundreds of specific ailments they list. The cure for claustrophobia? Little House on the Prairie with its wide open Kansas skies. 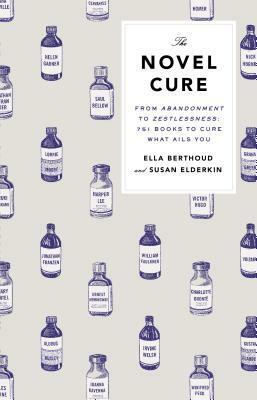 The cure for hypochondria? The Secret Garden with its tale of Colin's surety he's dying and fear of life. The cure for regret? These Is My Words: The Diary of Sarah Agnes Prine and the title character's determination to move forward with pluck and resilience from sorrow and hardship. The "illnesses" listed range from the physical (Hay Fever, Headache, and Hemorrhoids - all on the same page) to the financial (Broke, Being; Tax Return, Fear of Doing) to the emotional and spiritual (Angst, Existential; Left Out, Feeling). They cover the serious (both Cancer, Caring for Someone with and Cancer, Having) and the less so (Tea, Unable to Find a Cup of). There are literary prescriptions for Control Freak, Being a and Libido, Loss of and "Ten Best" lists to address Humorlessness and Flying, Fear of. Additionally, scattered throughout the book are ailments specifically related to reading: Skim, tendency to; Children requiring attention, too many; Vacation, not knowing what novels to take on; and both Sci-fi, fear of and Sci-fi, stuck on. Truly, there is something for absolutely every reader here, with a delightfully cheeky humor throughout. Oftentimes, the suggested reading offers a cure in the sense of a cautionary tale. "Don't be like Lily" the entry on Broken Spirit warns of the antiheroine in Edith Wharton's House of Mirth. And frequently, opposite ailments are highlighted side-by-side, such as with Sleep, Too Little and Sleep, Too Much or Mother-in-law, Being a and Mother-in-law, Having a (which, incidentally, are both treated by reading the same volume.